When I was a girl, I was a motor mouth. As borderline abusive as this practice was, there was some truth in the designation. I talked a lot. All the time, in fact. I talked to my neighbors at my table. I talked to my friends across the room. Often I would mutter to myself. I was a social creature. I still am. My poor husband, not a social creature by nature, now carries the burden of Ms. Levin. But unfortunately for him, he has not only my incessant chatter to contend with, but also our oldest son’s and daughter’s. They inherited the Motor Mouth gene. My chatter tends to run over into my writing. I’ve said often in the past that I “write in order to know what I think.” I didn’t make that up. Author Stephen King has said it. Historian Daniel Boorstin is claimed to have said a version of it. I wonder if those guys were motor mouths, too. Probably. The best part about blogging is that it’s almost acceptable to be a motor mouth. Not so with traditional, published writing. In magazines, books, and newspapers — the kind of publications people still pay money to read on a regular basis — our motoring is required to be more thoughtful and refined. I respect this. I think it’s a sensible, if often boring, practice — carefully choosing your words and paying fastidious detail to grammar and punctuation. Which is why, when I have a more thoughtful and potentially refined idea for a story, I don’t blog it. I save it. I have one right now, in fact. It’s been percolating inside of me for about two weeks, ever since I first started saving books from the recycling bin. As you know, I live on a kibbutz in northern Israel. It’s a kibbutz that was established about 30 years ago by the Masorti movement in Israel; Masorti being the equivalent of Conservative Judaism in America. Many of the new residents of the kibbutz were from English speaking countries: the U.S., South Africa, England. When they came to Hannaton, they also brought with them their English language books, which presumably went into the communal library once they landed at Hannaton. 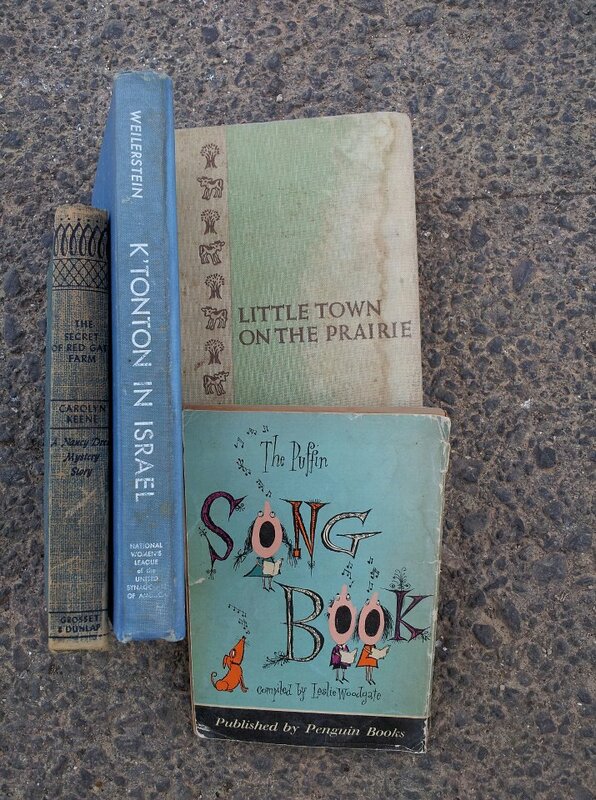 Recently, the library at Hannaton, like the kibbutz itself, underwent a huge renewal project. A volunteer committee sorted through the books to determine which ones would remain in the new library and which ones were either duplicates or in an unsuitable condition. There were thousands of books to sort — and since we’re in a Hebrew speaking country, there weren’t many nearby options for donating. The committee decided to put the unsuitable books in the recycling pile. But, as we know, one person’s trash — or in this case, reusable waste — is another person’s treasure. When the books were finally hauled away by the recycling truck, I had saved about 30 books and 15 magazines, including Highlights from the 1980s with “Hidden Puzzles” left untouched for my 5 year old to explore; and a Cricket magazine from the year I was born, 1974. I saved a Scholastic paperback from 1981 written by Ann Reit, an author and editor I had the privilege of briefly working with, and who has since passed away from cancer. I saved a much older Scholastic paperback whose jacket cover previews a young adult fiction story that centers on racial integration in the 1950s. I saved a few ChildCraft How-to science books that are surprisingly still reasonably current, and a few history books that aren’t, but are still fun for my 9 year old to leaf through over a bowl of cereal in the morning. There were Hebrew books, too, but I didn’t save any. The only Hebrew language publication I saved was a pamphlet printed by a professor in 1944 that documented all the agricultural settlements and their products up until that time. 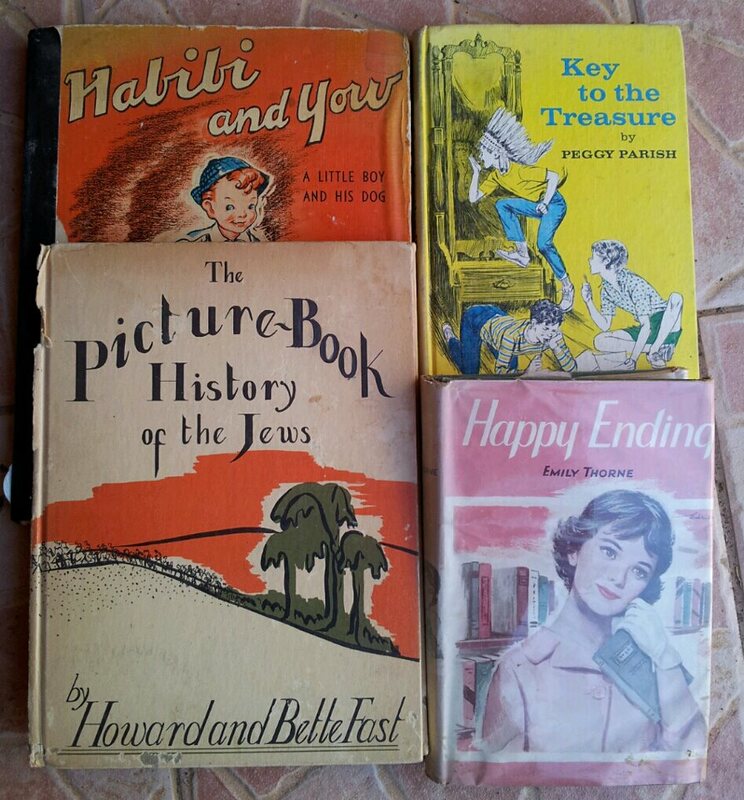 I have no need for more dusty coffee table books, but couldn’t resist this vintage They All Are Jews, a gift to “David” in 1951, after his confirmation. Inside I found a newspaper clipping from when Miss Israel won Miss Universe. motor-mouthing wasn’t soooooo bad. Most of what you said was relevant and had some information content, as opposed to inane chattering. I am all in favor of passing on the motor-mouth gene. I wonder where you got it? Oh wow I love treasure hunting!!! Loving your blog, Jen, I’m so glad I found you on Instagram! That’s exactly how I see it — treasure hunting (or digging for artifacts)! So glad you found me too!